PLEASE NOTE THE LIGHT BLUE AS IN THE THERMOMETER IS NOT CORRECT THE THERMOMETER HAS BEEN CHANGED BY THE MANUFACTURE AND IS NOW JUST BLUE AND RED ( NO LIGHT BLUE ) AS IN THE PICTURE. The simple and easy to use Zeal Round Fridge/ Freezer Thermometer uses a quick reference colour coded guide on the face of the thermometer to advise on the optimum temperature for your fridge/ freezer whether this is at home or to assist a catering industry. Designed to hook onto a fridge or freezer shelf, the Zeal round fridge/ freezer thermometer gives a true reading of the temperature your food is exposed to. 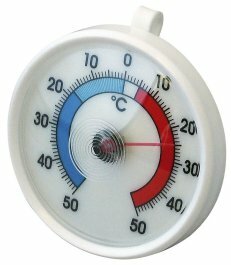 If you wish, the Zeal Round Fridge/ Freezer Thermometer can also be used as a room thermometer. We use these in fridges, freezers, and transport cool boxes. Used to measure temperatures for our environmental health records. Great items which read the correct temperatures. Recommend and will use these again. Easy to read and doesn't fall through the shelves. Use this in the Arctic to measure outdoor temp. Need a lightweight thermometre that can travel well. Lost the last one so got the same again. I was hoping that this invitation to review was a reply to the email I sent to Thermometers Direct a few days ago, requesting information/instructions to return/relace the two thermometers because the dials were not marked as shown on the website. Sales team, please see my previous email! Sorry for the problems the thermometer it is colour coded still with blue and red, but not with the light blue colour as in the picture, which the manufacture has changed this and yes the photo is wrong but the thermometer is still fit for purpose. Its a pitty we not given a oppertunity to sort the problem, as until today in your email to us we knew nothing of this problem. We can only help if we know of problems. IN yourcase as in the email we have sent to yourselfs we have given you a full refund and you can KEEP the thermometers. Delivery was very quick and order completed correctly. The thermometers themselves seem to be just the job and the price was surprisingly cheap! Thank you TD.